Last week was a doozy. I worked late on Friday and arrived home in need of some whiskey and a comforting meal–in that order. Fortunately, the night before I’d thought to defrost some of Lewis Waite Farm‘s most excellent kielbasa and soak some flageolet. 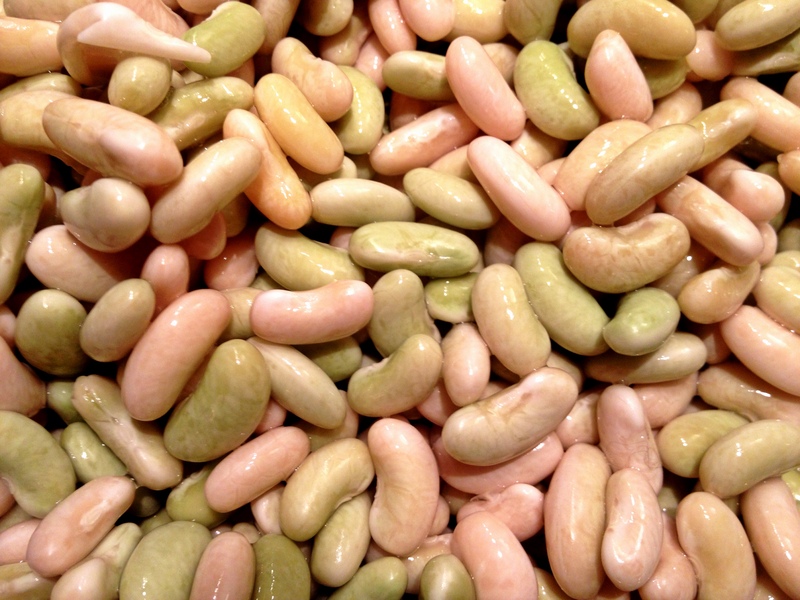 Flageolet are a lovely pale green bean used in rustic French cooking, including cassoulet. 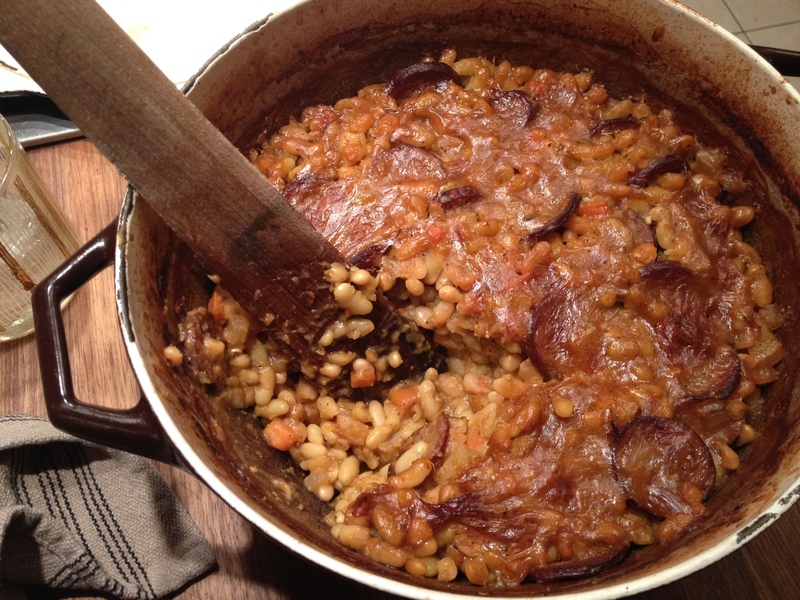 I had a classic cassoulet once and it was delicious. Saveur’s recipe calls for duck fat, ham hocks, pork shoulder, pancetta, duck confit legs and pork sausage (that last one being optional) and, by my rough estimate, takes about eight hours. While I am not averse to spending an entire day cooking, eating such a heavy meal at 4:00am seemed ill-advised. The recipe below will yield a rich, comforting meal for a crowd in under two hours. Melt a tablespoon of pork fat in a large dutch oven over medium heat. Add the onions and sauté until soft. Add the garlic, tomato paste, herbs, and red pepper flakes. Sauté for another minute. Then add your pork stock plus enough water to cover the beans, turn up the heat to bring to a boil, then lower to a simmer. Melt the other tablespoon of pork fat in a large cast iron skillet over medium heat. Add the kielbasa slices in batches, searing on both sides. Dump these in with your beans. Stir in the carrot and radish along with some black pepper. Pop a lid on your beans and tuck them into the oven for 30 minutes—or until your empty whiskey glass compels you to go back into the kitchen. Take the pot out of the oven and check on your beans. If they aren’t yet tender, let them go a little longer. If they yield easily to your teeth, stir in the vinegar and salt and pepper to taste. Turn the heat up to 350 and place back in the oven uncovered for 45 minutes—or until you’re in desperate need of something to soak up the whiskey. This entry was posted in main courses, meat, soups & stews and tagged beans, pork, sausage by Jasmine Nielsen. Bookmark the permalink.